Apple today updated its online store for refurbished products to add a selection of 13-inch 2017 MacBook Pro models equipped with a Touch Bar. This is the first time the 2017 machines have been available through the refurbished store since their June 2017 release following the Worldwide Developers Conference. 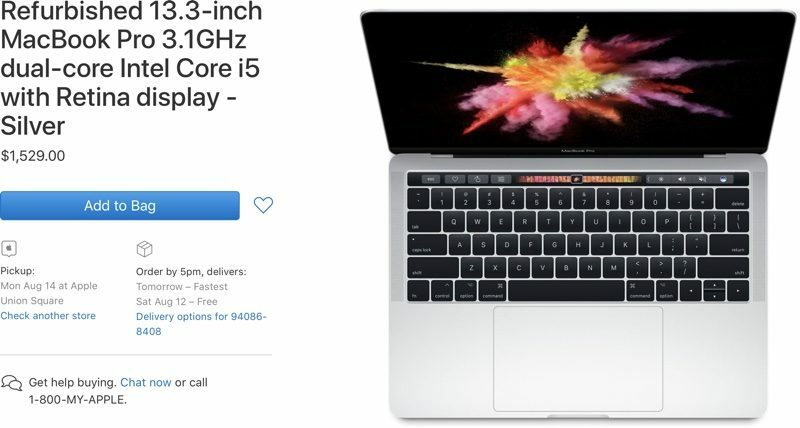 Apple was offering approximately 15 models at the time this article was written, with each MacBook Pro approximately 15 to 16 percent off. A top-of-the-line 3.5GHz/16GB/1TB model that normally sells for $2,899, is available for $2,459 in the refurbished store, for example. Apple has both Silver and Space Gray models in a range of configurations, with prices as low as $1,529 for the entry-level Touch Bar machine. 15-inch MacBook Pro machines released in June of 2017 are not yet available in the refurbished store, but could be added soon. All of Apple’s refurbished products go through a rigorous refurbishment process before being offered for sale, which includes inspection, repairs, cleaning, and repackaging. Refurbished Macs come with a one-year warranty that can be extended with an AppleCare+ purchase. For more tips on purchasing a refurbished product, make sure to check out our guide. increase the base storage to 256GB SSD and cut the prices across the line. It is very expensive with all the dongles. I've always been an advocate for Apple's business model of charging premium prices for premium products, and not going down the rabbit hole of trying to sell cheap enough so everyone can afford to buy one. The PC market was terrible for a long time with everyone chasing the absolute lowest price, cutting corners all over the place as they went. But in the last few years, it's really changed. Other companies like Microsoft copied the idea, selling more upscale gear that really competes with Apple's products (except for the fact it still runs Windows and not OS X!). But more importantly - I think Apple lost their way a bit. They've been selling some of the highest priced systems they've had in the last decade, but loaded with compromises and flashy things that are far from proven worthwhile features to pay extra for. For starters? There's NO reason that all Macbook Airs sold today shouldn't come standard with 512GB of SSD storage. The prices on SSDs have dropped sharply, to the point where on the PC/Windows side, I can buy even top-tier 512GB SSDs for under $240 or so, any day of the week. Even people who say "I won't ever need that much storage." are foolish for thinking that way when buying a new laptop that's going to cost them upwards of $1,000. Our employer, for example, purchased the corporate version of DropBox - and people are always sharing folders of content related to various projects. If you use a Macbook Air in our office, you have to constantly deselect things with "selective sync" in the DropBox app to prevent it from filling your drive up if you have a 256GB SSD. All of the dongles for the current lineup of Mac notebooks is ridiculous too. They should include a set with each machine for what they cost, period. That doesn't seem like much of a discount. It would be nice if a $trillion company would give really deep, generous price cuts on used merchandize. When the refurbished models are basically good as new, 15% off isn’t bad. If insanely great is to remain a standard, why reward Apple for sub-standard results? Exactly, it's USED, refurbished is just some (Apple) spin. Refurbs aren't simply second hand products that somehow ended up back in Apple's hands. They're usually returns that Apple had to fully refund, or defective machines that Apple sent out replacements for and have subsequently been fully repaired. They're thoroughly inspected and cleaned, and brought up to and indistinguishable with "new" condition, but they can't legally be sold as new. 15% is a fairly decent discount for a machine that may as well be new, and it's not like Apple's "selling it" a second time and making pure profit. You just don't get the "prestige" retail packaging, that's all there is to whine about. I bought my daughter a refurb MacBook Air a few years ago, and I've had zero complaints about it. The person you gave a free laptop to hasn't complained? What an endorsement! When you have teenage kids you'll understand. Pretty quick. Makes them a little more affordable. I am sorry but these things are NOT an upgrade. The reliance on dongles is incredibly annoying for a "Pro" model.